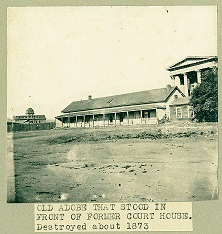 HIstory of The Courthouse cont. Welcome to the Santa Barbara County Courthouse. This dramatic structure is the centerpiece of Santa Barbara’s Spanish-Revival style. Designed in the Spanish Colonial Revival style, construction started in 1926 during the period when this style was popular. To find out how this Spanish-Andalusia courthouse came about we need to go back to 1850 when California became the thirty-first state admitted to the Union. Santa Barbara became the county seat and courts and county offices were needed. In 1855 the county purchased the adobe mercantile store of John Kayes and made it the first county courthouse on this site. County officials over the years became displeased with this undistinguished adobe building which symbolized the frontier, the building was also becoming too small for the fledgling county government. The Civil Grand Jury in its 1870 report considered it a disgrace. Americans who had come west were used to monumental courthouses symbolizing law and government.